Tonight, at TESOLFrance‘s annual colloquium, I had the privilege of meeting Karen White, Karen Spiler and Sue Kay, and listening to them talk about their excellent resource ELT Teacher to Writer. The idea is to train teachers in the areas of content writing that the publishers value/need and then put writers and publishers in contact with each other. The first statement I got wrong was ‘Publishing companies decide what type of materials they are going to publish years in advance.’ There were mentions of publishers’ ‘5 year plans’ and the (cosy) prior knowledge of changes to certain exams informing release dates of new publications. But 5 years is the time it takes some language learning companies, such as busuu or duolingo, to be conceptualised, launched and reach millions of users. Things change so fast these days that a 5 year plan could be redundant after 1. That’s not to say a long term plan isn’t good business practice, but the idea that publishers can predict the market so far in advance is becoming ever less believable. We can learn so much in 5 years, and we can help our learners by using that knowledge now, rather that having such a long lag. The other statement I got wrong was ‘Publishing companies invest heavily in market research and use the results to inform that material they publish’. The word I took umbrage was with ‘heavily’. And it turned out to be well-founded umbrage, as the figure of 3 million dollars was mentioned for a coursebook research and development. But what about the time it takes to conduct this research? And what about the market fluxes during this time? The phrase ‘agile development‘ is used widely these days, but basically because it reflects the working practices of an increasing number of players in an increasing number of industries. And one of the tenets of agile is ‘fail fast, fail often‘. Simply put, a company that invest so much time and money in a product can’t possibly fail very often and stay alive, so they had really better hope they don’t fail. But if we can get a product (coursebook, exercise, activity, game… however you want to define it) out, then we can gauge reactions to it, implement a back-channel, analyse the results, observe behaviour and make changes where they’re needed. That way we don’t need to fear failure, we can embrace it as helping us improve the experience of our learners. As it is, I feel we’re sticking to the same old ways of working, producing similar content for a similar publishing industry, thus confining learners to a similar path. But now we have a chance to do something new, to push things, to break things. I’m not saying we discard theory, quite the opposite; we should test theory, stretch it and make new conclusions about how people learn. In short I think we should try to adopt another tenet of agile: ‘move fast and break things.’ It’s companies like ELT Teacher 2 Writer that are in a perfect position to help bring about this change. My research suggest it takes about 10 years for the major publishers to respond to SLA findings, if they do at all. They are understandably risk averse but recycling the same old stuff edition after edition might, by some, be considered a fairly transparent income generation scheme – to put it diplomatically! In the rush to ‘move forwards’ we must also not discard some of the very innovative ideas from the past which are right now being supported by new research – Lozanov, Gattegno and others have much to offer us, not as complete packages as they might have wanted but in terms of technique which responds to what we now know about SLA. Good piece! I think I can let people know that OUP have got the gestation period down to a bit, it took them two and a half years from when I sent them my stuff (which they called “innovative”), plus a couple of rejections in the interim, before a hugely similar course book popped up online. I’m very very interested in the figure of 3 million dollars for coursebook research and development. Where did it come from, can I get a steer and what back s it up? I should start by saying that I am a big fan of new, innovative, agile approaches to ELT publishing and I’m excited to see how the trial and error approach to ELT materials works out. However (you knew that was coming! ), surely that’s only going to work for certain markets, i.e. those prepared to take risks and be flexible. A huge chunk of the ELT market though is even more conservative and risk averse than the big publishers. Government ministries that often account for huge volumes of sales, for example, are likely to want the same, reliable, safe formula that they’re familiar with, that their teachers are trained to teach and that fits in with their syllabus, exams, etc. If they decide to go with a coursebook from a major publisher, they expect it to be the finished, polished article, not something experimental that they’ll be expected to give feedback on. I’m not saying that any of that is particular ‘good’, but it’s just the reality in many markets. Well, I am right now in the middle of a 6 month sabbatical where I am working on an eLearning ‘showcase site’ for Business English. It will most certainly be very different and very innovative. It will not look anything like an ELT coursebook, and anything like the boring PPT slides and decontextualized presentation and practice of a GlobalEnglish or an EnglishTown. It will look most like one of my books such as Business Vocabulary Builder brought to life with video, humour, real teaching and much more. Here’s the issue: 6 months of hard work, no money coming in, family to support, around £10,000 costs above and beyond my loss of income (software licences, web development, paying an editor and a few other collaborators). I guess that by Easter I’ll have ready about 2 hours of online content at each of PreInt, Int and Upper Int levels. So ‘move fast’ is okay in theory, but I’ve been surprised by how long it takes to produce the materials. The site will be called BEhereBEthere (as in ‘Business English here, Business English there’), and has existed as a holding page for several years. I’ve been linking to it in a banner on my PaulEmmerson.com site (which is totally different and is a blog aimed at teachers). You’ll have to wait till Easter and judge it then. After Easter I’ll be going back to teaching because I’ll be broke! Current game plan for BEhereBEthere is to build traffic to the site after Easter, capture leads, and then try for crowdfunding this time next year. If I can get the funding I’ll have money to pay myself and others to build a really great site over the course of a year or so. Then it will launch with a freemium model. But any of the above could change. Paul, that sounds absolutely fascinating. I can’t wait to see this when it comes out. I’m surprised that it is taking you so long to produce the content? Why is that exactly? Well, I can’t give too much away. Let’s take just one example. One section of my site will be like the first half of Business Vocabulary Builder, but with head and shoulders of me talking direct to camera with visual reinforcement of images and text. I’m subjecting all my content to the full editorial eye of someone who’s edited my print stuff in the past. So that’s writing a script, editorial, second draft. Then setting up a video recording studio in my attic, with green screen and lighting so that I float on the background. Then various takes to get the video right. Then pulling it into my authoring tool and finding, adding and synching animated images. Making all the images png with a transparent background rather then jpeg, often needing fine paintbrush work (eg the middles of Bs). Doing it all again for different levels and different topics. And that’s just one section of my site. Small things take a day. I realized I needed a textured background rather than white and I discovered the site subtlepatterns.com. Choosing textures from there took me over a day – I had to look at them all (300+) select some and then try them out in my authoring tool. I have been teaching myself Instructional Design, a subject that you can study in its own right at university. Will you be publicising it on ELTjam when it comes out? I’ll keep an eye out for it, anyway. I’ll be publicizing it everywhere I possibly can! In fact the newsletter sign-up on the BEhereBEthere holding page is working. You can join the mailing list there. This sounds like a fascinating product and I’m really looking forward to seeing it once you’re ready for the launch. Needless to say, we’d be very keen to cover it on the blog whenever you think it’s the right time. Here is a sneak preview of the kind of thing I was talking about in my Jan 14 reply to Thomas Ewens above. It’s work in progress. I will keep this up for three days (until end of Friday 17th Jan) and then delete it. Please don’t start blogging and corresponding with me about it – I need to keep focussed on creating content right now. Everything else can wait. If you work for another provider of online Business English eLearning please don’t click and look! Wait until I go public after Easter. When I started working in publishing and encountered 5 year plans for the first time, I thought it was hilarious (what with the Soviet overtones). However, the level of detail 5 years out is likely to be along the lines of “Jan 2019: New 6 level general adult course” – so, I’m not sure a publisher will have decided exactly what the materials are 5 years in advance, just that they anticipate a gap in their product portfolio which a certain type of product should be expected to fill at that time. The 5 plan year plan in itself, therefore, isn’t dangerous – it’s the false sense of comfort that it gives about the stability of the world in which you’re operating. $3m on market research and development for a course? Hope it turned out to be an amazing course – that’s not a typical amount, in my experience. I think there’s huge scope for publishers to improve how they research and develop courses. ‘Research’ can typically consist of: asking sales reps what they want, visiting a few schools and carrying out some focus groups and maybe a few questionnaire responses, then getting some reviews of sample content and maybe a sample unit. The real aim of most of this is to validate a product spec that’s already been decided on. And it’s still often seen as good practice to do the vast majority of your research before beginning to create the product. When it takes years to produce a course, that’s a very high risk approach in a fast-changing market. With a totally non-agile and very slow and expensive product development process, publishers can’t afford to take risks with their major investments, as Julie Moore says. Sounds like a market ripe for disruption to me. If products can be developed iteratively and rapidly, with far greater customer involvement throughout the process, then we might start to see more interesting things being developed in ELT. That might mean not worrying so much about ministries and large institutions at first – start by focussing on those who might be more receptive to something better and maybe less safe and familiar – and then build from there. The risk in playing it safe is that ultimately someone develops something that large institutional customers would never have asked for but, once it’s put in front of them, they realise it works better for them than a Headway or English File clone. Jo, you say: “As it is, I feel we’re sticking to the same old ways of working, producing similar content for a similar publishing industry, thus confining learners to a similar path.” I agree, and would add that it not only confines learners to a similar path, it also sets ELT publishers on course for gradual decline and then irrelevancy. I would see getting their act together with regard to agile/lean product development as a pretty obvious (if not easy) first step for any publisher. Laurie, surely the obvious path is for big publishers to be doing both things together; trying out new ideas to appeal (initially) to more adventurous customers, while keeping the ‘safe’ mainstays going to keep the money coming in (and maybe fund the exciting new stuff?!). Then as the new ideas and ways of working gain acceptance, they’ll shift across. I agree Julie! Publishers need to pursue both paths. I don’t think there’s much evidence of that happening yet in any kind of systematic way, though. Even when there are attempts to be more adventurous, they’re still run through the same old publishing process. And there’s plenty of scope for even the ‘safe’ products to be developed more quickly and efficiently and with less risk, thus freeing up resources for other things. My only fear about the “developing products more quickly” route is that quality suffers. I’m really wary about the new trend towards teams of writers being used to bang out a whole load of materials in a really limited timeframe, with responsibility for coherence, direction, flow, consistency, etc. often down to editors – who whilst very good at what they do (i.e. editing) don’t always have the in-depth know-how about teaching and learning that writers (hopefully) do. To borrow one of Diane’s metaphors, do we just want to bang out fast food in eye-catching packaging? 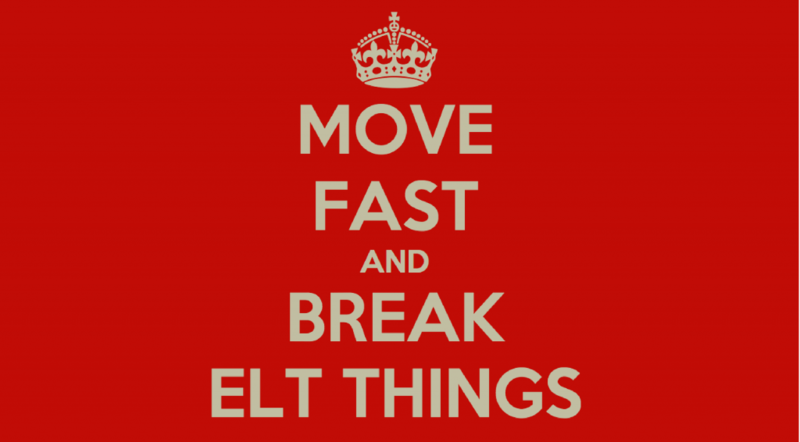 I think it’s too easy to tell ELT publishers what they should do or to criticise them for doing things that make them money – they’re businesses and if they’re making money, they’re succeeding on their own terms and selling something that people still want to buy. Why would they want to break anything that is working for them? There is no need for them to throw out either bathwater or baby. All they need to do is add some luxury bubbles and maybe some massaging jets. (Hot water that stays hot for longer would be a nice innovation.) I think, given that they don’t *need* to take risks and people still want their products (maybe not a lot of their end-users, but the people who pay the money at least), there’s nothing to break, from their point of view. They just need to add a few extras for now, and in the context of a major course, that can be in the accompanying digital and teacher resource offerings, for example. This is the place to try out new things. And I’ve seen some great and refreshing stuff. If these extras are well received and the feedback is good, then maybe there’s a good indication that they should be absorbed into the main product next time around. But what the publishers have that start-ups and venture capitalists don’t, on the whole, is *reputation*. People know what they can expect from them and that is tried and tested, well researched products written by experts that follow a formula everyone knows, teachers are familiar with and students respond to. Start-ups can be have-a-go heroes where traditional publishers can’t, because people aren’t coming to the new kids on the block with the same experience-based expectations. Nobody will be put out if they’re doing something new and different – they can afford to fail and just start up again. A start-up can keep on starting-up. They can tout around their keen embrace of failure as a virtue. If an established business of many years’ standing put out a product that they knew to be unfinished, not thoroughly tested and generally not ready until it’s been used a lot, there would be outcry. A response from an established publisher along the lines of ‘oh well, we’re just learning what doesn’t work’, would be in the national press! To move awkwardly from a bathroom metaphor to a business metaphor, imagine you have a traditional family-run restaurant with hundreds of loyal customers, guaranteed full-house covers for the Sunday roast, some Michelin stars, a steady stream of diners throughout the week and a clientele that keeps coming back for more – because they know what they’ll get and enjoy it. Down the street, several pop-up restaurants have sprouted up overnight offering experimental cuisine by comparatively inexperienced chefs. Would you ditch the Sunday roasts and start doing cook-your-own sweetmeats nights instead? No. You’d wait and watch and see what was going down well down the road and what wasn’t, whether you were losing your regulars to the newcomers, how long some of them lasted, which ones did and didn’t and why. Then, maybe you’d start slipping in a tapas night midweek or adding some offal or rarely seen dishes to the usual menu. You’d start by putting them on the ‘Specials’ board and the ones that went down well might be integrated eventually into your main menu. You might have special nights when you invited a talented chef of some different cuisine to your usual fare to be guest chef. You’d see what the response of your customers was to what was on offer down the road and to any gradual changes you made in your own establishment. You would, above all, want to keep your customers and to keep meeting their expectations. And you would leave the large-scale ‘breaking of things’ and the ‘failing’ to the pop-ups. The publishers also have a great responsibility towards *learners* and will be loathe to just try stuff out on them and see what they say and then tinker with it later. A start-ups potential customers are unknown; there is no previous relationship, there are no expectations. ELT Teacher 2 Writer is playing a fantastic role in introducing the traditional, established ELT publishers to new talent and at the same time equipping people who are perfectly placed to produce great new materials with in-depth training in how to produce what publishers need from them. To stretch the metaphor, they’re training up the great new guest chefs of the future and putting them in touch with restaurants – restaurants that want to try new cuisine on their specials board and ones that just want more Sunday roasts, because it’s working for them. They are adding to the pool of great chefs of the future. As far as I know, ‘breaking things’ isn’t part of their ethos. I think that talking up ‘failure’ can be liberating and I’m very much in favour of innovation (in fact, hungry for it! ), and, I am a keen explorer of a lot of the new products that are coming onto the digital ELT scene. But for me, if the producer’s ‘failure’ means that I waste my time on something that doesn’t work or gives misleading results, I don’t want to supply feedback to make it better, I just log out and move on. Great post, Diane. Let’s work that restaurant metaphor a bit more… What’s to stop the established restaurant being more proactive and buying up some of those pop-up eateries or setting up its own? Keep the Sunday roast gravy train (sorry…) going as long as possible, and take ideas from the pop-ups that could enhance it and extend its life. But also, don’t assume that market will last forever – try to develop its replacement yourself rather than let someone else do it and then wonder where all your customers have gone. Evolution AND revolution. Maybe Laurie, and I’m not just guessing here, there is a complete lack of trust and respect. For example, OUP have an IP lawyer calling himself a “product curation expert” on LinkedIn inviting innovative publishers to show show him their digital content. How do you think an IP lawyer ‘curates product’? Until students (the real end user) are buying courses/materials off their own backs, as opposed to being provided them by the purchasing institution with some input from teachers who often want English File because it’s familiar, I think publishers have little reason to make big changes. I’m still waiting for a major course book that doesn’t focus so heavily on grammar – that’s all the innovation I’ve wanted for 10 years! (Hugh Dellar’s Innovations being the only one I can think of that I’d count). The move of the major publishers towards adaptive learning (see previous posts on this blog) is likely to make ELT materials more conservative than ever. The development costs are going to be much higher than in the past (at least for the first projects of this kind) because of the need for huge investment in both platforms and interactive content. As a result, we shouldn’t expect any methodological innovations, which will be perceived as risky (i.e. any methodological innovations at all): shareholders and advisory boards will be expecting some sure returns on the investment. It’s sad and ironic that technological innovation can have retrograde effects … but I guess we already saw that with language laboratories and IWBs. Philip, I agree with you there. It bugs me that when it comes to technology, publishing companies and others love to talk about innovation and are happy and proud to boast about how innovative and original their products are. Yet, when it comes to methodology and content they are ultra-conservative. We are told then that innovation is risky, that it could cost a lot of money if it backfires, that teachers aren’t ready for it etc etc. In their eyes these drawbacks don’t apply to technological innovation though, of course. Quite frankly, I’m beginning to think that a lot of Ed tech is just a load of b.s.